Osteoporosis is a degenerative disease during which bones become brittle and weak. Although this condition makes fractures more likely, the diagnosis of osteoporosis does not mean it is a life sentence. There are osteoporosis management tips that can allow women to continue living productive lives. 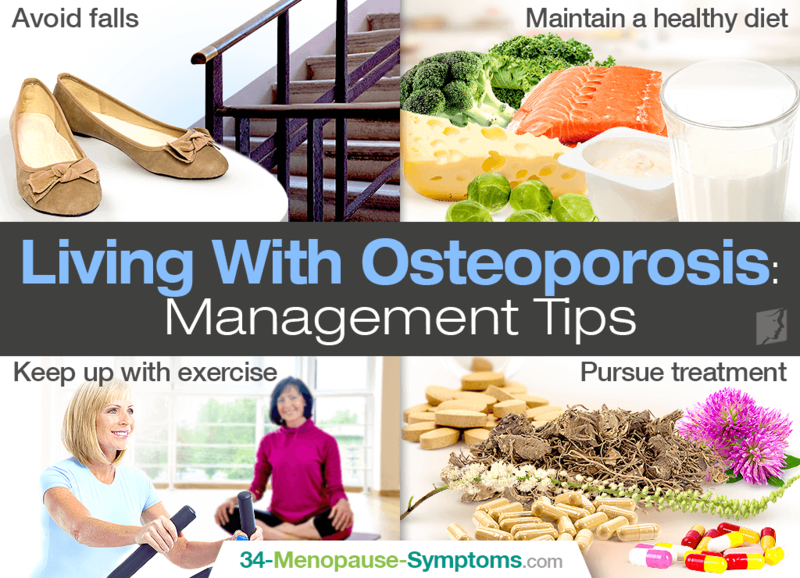 Continue reading to learn more about management tips when living with osteoporosis so that you can make the most out of your twilight years. Wear comfortable shoes with good support that have patterned grips or tread. Clean glasses regularly and keep them in good repair. Keep hearing aids functioning properly. Speak with your doctor about medications that may cause dizziness as a side effect. Avoid wearing clothes that are long and trailing. Ensure that carpets, rugs, and mats are not loose or frayed. Install handrails on the stairs and alongside the toilet and bath. Place non-slip mats on polished floors and in the bathtub and shower. Clear up cluttered areas, making sure wires and cords are tucked away and that furniture is out of walking paths. Keep your house well-lit with light bulbs you won't need to change as often. Have regularly used items at an easy-to-reach level. Maintaining a healthy diet for osteoporosis management includes eating foods rich in vitamin D and calcium, which are necessary for healthy bones. Options include dairy products such as low-fat and non-fat milk, yogurt, and cheese; fatty varieties of fish, like sardines, salmon, or mackerel; and fresh vegetables, including collard greens, kale, okra, broccoli, peppers, and Brussels sprouts. Women in their mid to late 40s should also be reaching for foods rich in phytoestrogens, or plant-based estrogens. Estrogen improves the body's absorption and retention of calcium, thus slowing bone loss. Foods rich in phytoestrogens include soybeans and soy products; sesame seeds; flax; oats; barley; and many more. Furthermore, developing research is appearing about the link between consuming omega 3s and bone health, suggesting that these antioxidant fatty acids have benefits for osteoporotic patients as well. Healthy omega 3 options are berries; nuts and seeds; plant oils, like flaxseed oil; or fish and other seafood. Also, keep the following considerations in mind when looking to maintain a healthy, osteoporosis diet. Stay hydrated since dehydration can trigger weakness, causing unpredictable falls, and limit sodium, alcohol, and caffeine intake since excess amounts can cause the body to lose calcium. While it is important to maintain a steady exercise routine, women living with osteoporosis should acknowledge their limits and try not to participate in too much too soon. The goal is to improve muscle function such as balance and strength, lack of which increase the risk for falls and bone fractures. Within the first few months of being diagnosed, if not already active, postmenopausal women should strive to walk or power walk for up to 20 minutes at a time in order to become accustomed to the impact body weight has on their bones and joints. Then, after three months, women are recommended to start slowly varying low to high impact aerobic exercise with muscle-strengthening workouts into their exercise routine. It's better to start with 10 to 15 trainings and gradually build up to the recommended 30 minutes per day. It would be wise to consult with a trusted healthcare professional for an individualized workout plan. The goal of osteoporosis treatment is to slow down the progression of bone resorption - which is the breakdown of bone - and increase bone mineral density, the strength of bones as shown by calcium content. While there are a variety of treatment options available for postmenopausal women living with osteoporosis, the most effective resolve the underlying hormonal imbalance at fault. Without a doubt, postmenopausal women suffer the highest risk of developing osteoporosis due to the dramatic drop in hormones once ovaries stop reproductive functions. As such, osteoporosis treatment might consist of alternative medicines - including phytoestrogenic herbal supplements and hormone-regulating supplements - in addition to pharmaceutical options like hormone replacement therapy (HRT), which involves serious side effects. Women should weigh pros and cons of all options before pursuing treatment. A diagnosis of osteoporosis does not have to mean the end of one's mobility. Management of osteoporosis is possible by preventing falls with instilling measures to maintain your balance and adjusting your home décor; sustaining a healthy diet rich in vitamin D, calcium, and omega 3s; keeping up with exercise to improve balance and muscle strength; and staying on top of treatment proven to fix the underlying hormonal imbalance. Don't accept these years as a sedentary sentence; take action today! During menopause, it is very common to develop osteoporosis. Not only are women at a greater risk as they age, but through this transition, there is also..
Osteoporosis can be a painful disease, but there are a number of treatments available to help you manage it. Learn more about osteoporosis medications! If you are a perimenopausal, menopausal, or postmenopausal woman, than you are more likely to get osteoporosis than any other group. Find prevention tips.